Update (Mar 2014): If you have come here from a search engine, I should make you aware that unfortunately, Thomann stopped selling Harley Benton-branded Ministar guitars a few months ago. It appears I was fortunate to snap mine up when I did! Over the years, there have been all sorts of attempts to produce guitars which are designed primarily for “travel” use. I won’t waste time with a potted history (a Web search for “travel guitar” should give you more than enough to work through if you wish), but one of the more intriguing efforts, to my mind, is the Ministar range. Conceived by guitarist and engineer Bob Wiley, an article on the Ministars at the Gizmag site describes them, not un-aptly, as “essentially a bunch of necks with pickups”, although this understates the ingenuity, and to a great extent, the practicality of the design. The full Ministar range runs the gamut of guitar types, from electrics (Strat, Tele, Les Paul, P90, jazz, etc. ), electro-acoustics (steel- and nylon-string), hybrids (a 12-string with piezo and mag pickups) and basses (4- and 5-string, fretted and fretless). You can even buy “conversion kits” which turn your Ministar bass into an upright, or link together two Ministars of your choice into the most eye-catching double-neck guitar you’ll see all week. Although the Ministars are relatively affordable (about $300 in the States), I discounted the idea of owning one due to being on a tiny budget. However, recently I learned to my great pleasure, that the German music retailer Thomann is currently selling a selection of Ministar models under their budget instrument brand Harley Benton. The guitar arrived in a pretty sizeable box, which turned out to be mostly air and large plastic bubble-wrap. In the middle of all this was a surprisingly small gig bag… was there really an electric guitar in there? Indeed there was: remember the “neck-and-pickups” description of Ministar guitars from earlier? Well, that’s exactly what you get: imagine removing the body from a solid electric guitar, and you’re left with a “stick”-like instrument with the bridge and headstock at opposite ends. Harley Benton Ministar Testar, a set on Flickr. You can see from some of the photos, how the guitar is set up so it can be played comfortably, even without a body: you install a pair of what I’d call “body rods”, from which you can hang a regular guitar strap. One rod includes a wooden block, which gives the player’s right arm something to lean against—as you’ll read shortly, this really makes a difference to playing comfort, and it’s a sign of the thought that I feel has gone into designing Ministar instruments. Electrical controls on the Testar are straightforward: two small toggle switches on the “top” side, for pickup selection and for switching in/out an “out of phase” tone. I didn’t feel the latter made much difference to the sound (the “neck” pickup is perhaps a little brighter-sounding with it activated), but it doesn’t hurt to have the option. The tone and volume pots—the latter “nested” on top of the other to save space—are, oddly, situated on the bottom edge of the guitar, but I don’t use either that regularly, and I quickly got used to finding them by touch. The tone control is more or less “on or off” rather than a smooth “logarithmic” effect, so I tend to leave it alone unless I’m using an EBow, where the tone needs to be “treble-off”. On the back of the Testar is the SCAMP headphone amplifier, which unusually runs off two “watch”-style lithium button cells (presumably to save space—there’s very little of it on a Ministar). I wasn’t expecting much, but the SCAMP is rather more usable than I expected—it’s nicely quiet, with little extraneous noise. There are really only two tone-settings—a crystalline “clean”, and a pretty raucous “crunch” overdrive—but I found both quite listenable. If practising, if I wanted more than a basic tone, I’d be more likely to run the Ministar’s output into my iPhone (with TASCAM iU2 interface and JamUp Pro XT for effects/amp-sim) for practice and/or recording, but for a quick plug-in-phones-and-go blast, the SCAMP is dead-easy to operate and sounds fine to my ears. An option to route the Testar’s pickup output through the SCAMP en route to the main jack out, wouldn’t go amiss, but I won’t lose sleep over its absence. I found the guitar’s finish to be quite acceptable, especially given the price. The fret-edges are well-filed, although some felt a bit rough on the surface when bending strings—I guess, probably nothing that a fret-dressing wouldn’t fix. Moreover, I found the playing action just about right for me; neither too high nor too low, and probably the most comfortable I’ve yet found on a budget electric. When I bought the Testar, I admit my expectations were not high, largely because of its low cost. For me, if it was cheap, compact and played/sounded acceptable, that was all that I sought—basically, a “back-up” electric guitar that I could stow in an airline locker or car-boot, for the hotel room, caravan, etc. 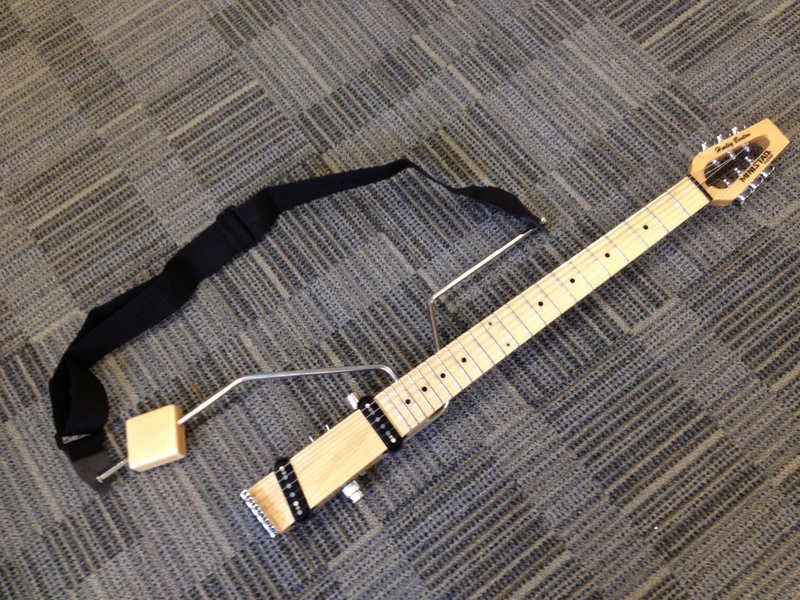 How well can a £90 guitar play/sound, especially when it’s effectively a neck-and-pickups suspended from two metal rods? Sound-wise: in terms of electronics, scale, etc., the Testar is based on the Fender Telecaster, and to my ears it does a fine job of impersonating the Tele’s bright twang, which was what I was looking for all along. Metallers would probably want to look elsewhere, but running the Testar through various amp-simulators, I was able to get the kind of tones I like (from Jack Johnson-esque clean to Status Quo-style crunch). Overall, the guitar feels and sounds to me more like an instrument costing two to three times as much as it did—in other words, more in line with the kind of price one would pay for a “real” Ministar in the US. I would be curious to find out whether these Harley Benton Ministars are cheaper “licensed copies”, or whether Thomann has basically sourced some “real” Ministar guitars (perhaps from the same factory) and simply added the HB logo onto them. I have no proof, but my experience of my HB Testar would suggest the latter—it feels, plays and sounds to me like a guitar costing £200-300, rather than £90, and Thomann are known for some very keen pricing on the products they sell. As I said above, I had modest expectations when I found the Harley Benton Ministar Testar. My priorities for an electric “travel guitar” were: a very low price; more than one pickup (preferably in Tele configuration); and small size for travelling with. The Testar ticked all these boxes; I didn’t expect such a guitar to play and/or sound well at this price point, but if it did, that would be a welcome bonus. As should be clear by now, the Testar has surpassed comfortably what expectations I held for it. Not only is it the ideal electric guitar for carrying around with me, but I have found myself going to it for both recording and live use, even in preference to my Steinberger (which, whilst being a terrific guitar, is rather big and heavy, especially when standing with it). I would consider another Ministar if I was seeking a new electric guitar (though I hasten to add I’m quite happy with what I have for the foreseeable future). In short, if you are seeking an especially-portable instrument for taking on your travels, and you are open to an unusual-looking instrument which may feel different to the “norm”, I highly recommend checking out Ministar guitars, especially if you live in Europe and Thomann are still selling them by the time you read this. The Harley Benton Ministars are a total bargain, though if you are UK-based and want to look into the “proper” Ministar range, Play Away Guitars sometimes stocks them (and they’re a great retailer for travel-sized guitars, ukuleles and so on anyway). Based on your experience if I was looking for a more “authentic” fender sound, do you think the pickups can be change?